Where Are You Celebrating The 4th Of July? It’s official! Summer has arrived. As the notorious June Gloom weather winds down and with the 4th of July holiday just around the corner, it’s time to fire up the grill, grab the potato salad, turn up the tunes and gather friends and family to celebrate our country’s Independence Day. Whether your plans include spending the day at the beach, taking in a baseball game, or hanging around the pool, there are no shortage of celebrations scheduled throughout San Diego and North County. Of course, to cap off the day, fireworks are a must. For those who want to see the best of what our city offers, here is where you can watch some of the best parades and fireworks in America’s Finest City. San Diego County Fair – July 4th, 10:00am – 11:00pm Here is the last day for this legendary fair where people from all over attend. Enjoy fireworks, concerts, entertainment, amazing rides and animal exhibits on the Del Mar fairgrounds. For additional information, check out sdfair.com. Annual Big Bay Boom 4th of July Fireworks Show – The largest display in the county, fireworks are launched from four barges placed around North San Diego Bay. Watch from Shelter Island, Harbor Island, the Embarcadero and Seaport Village/Coronado Landing for one of a kind fireworks. Simulcast live on THE MIGHTY 1090AM and MAX FM 105.7, find a seat any place along the bay and you will experience a heartwarming and memorable 4th of July. City of Coronado – Celebrate the 4th of July with a parade down Orange Avenue at 10:00am followed by a concert in Spreckels Park at 4:00pm and stunning fireworks over Glorietta Bay at 9:00pm. Red, White and Boom! – Legoland, Carlsbad. With over 60 rides, shows and attractions, Legoland promises a 4th of July celebration your family will never forget. Fireworks start at 8:30pm and are set to patriotic music. Rancho Santa Fe Annual 4th of July Parade and Picnic – located at 16948 Avenida de Acacias, enjoy live music, parade and picnic from 1:00-3:00pm. All you need are a few chairs, a blanket and food to enjoy a nostalgic hometown event. Independence Day Festival and Fireworks – Escondido. Gather at 340 N. Escondido Blvd for this festive 54th annual holiday event. Over 20,000 attendees are expected to attend and indulge in food vendors, children activities, games, music, and of course, fireworks, for this hometown celebration. Starts at 4:00 with fireworks at 9:00pm. El Cajon Picnic and Fireworks – Kennedy Park from 1:00-9:30pm. Enjoy games, prizes, kiddie train rides and more including live musical entertainment starting at 3:00. Don’t miss the fireworks at 9:00pm. Julian 4th of July Parade – For those looking for a homegrown, historic event that celebrates a town’s heritage, this is where you want to be. This year, Julian is presenting a celebration of the town’s gold rush era history, with a dedication to Veterans and local residents who cherish the town of Julian. If you are staying close to home, and celebrating the 4th of July in your own backyard, perhaps you might find some of these amazing properties, currently on the market, as a great spot to enjoy the holiday next year. These stunning homes, with exceptional backyards and entertaining areas, afford everything you desire. There is no better view to watch next year’s fireworks than from this incredible backyard. This gorgeous waterfront home in La Playa offers dramatic views and the sound of the yachts and sailboats on the bay. An entertainer’s dream this home boasts panoramic views and seamless outdoor/indoor living. Truly designed for a lifetime of memories. This 19,000 square foot home that includes a three bedroom guest house, and an enclosed courtyard with rectangular swimming pool and spa, this historic home has been carefully restored and updated for modern living. Imagine watching next years 4th of July celebration from the privacy of this immaculate estate! 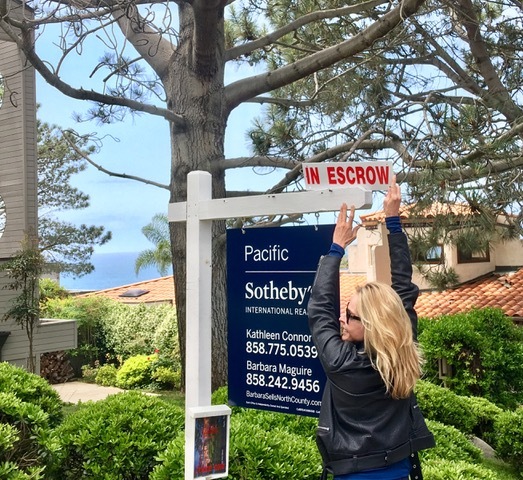 Overlooking the Pacific Ocean in this sought after North County town, here you will find a home that offers eight different locations for stunning water views including a 300 sq. ft. foot terrace and beautiful backyard with fire pit and water feature. The centerpiece of the limestone residence is a 3 story circular stairwell with a 20 foot chandelier and under lighting under the stairs. A glass elevator services all three floors with custom mosaics done by Rick Skalak, which are also featured in the Wynn, Bellagio and Peninsula Hotels. This charming single level adobe masterpiece is an entertainer’s dream. The home features two salons, both ideal for expansive entertaining or relaxed family gatherings. The pool patio offers rich views in a private setting. This romantic hacienda also features a charming guest casita with fireplace. Just imagine the fireworks you can view from this rarely available half-floor penthouse in one of downtown’s most exclusive towers. Soaring above the city and bay with unstoppable and unobstructed panoramic views, this residence features gracefully curved windows revealing the never-ending city scenes and water views from every room. Located in the heart of the Marina District, stroll in any direction to enjoy the best of downtown – shopping, restaurants, waterfront esplanade, Petco Park and more.